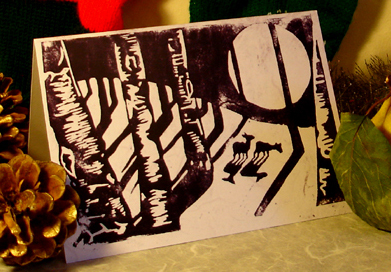 My 2010 Christmas cards are now available on Etsy ( www.etsy.com ) at the very reasonable price of £7.50 for 10! There are a limited number, so get in there quick! There are more designs available in South West Artwork’s online shop ( www.southwest-artwork.co.uk ), and they’ll be taking my cards as well as a variety of art and functional design work by other marvelous artists to the Poole Winter Arts Market, where they’ll be sharing a stall with The Cherry Closet and their lovely vintage clothing. The market will be on the 4th December from 10am – 4pm in the Town Square, Poole. Christmas!